We went to a county fair in Manassas, Virginia this weekend (Caryn took the photo above from the ferris wheel). It was a nice day, though naturally I can't go to a county fair without thinking about James Joyce's short story Araby, in which a boy yearns to go to a local bazaar but, upon finally reaching the place, finds only a sense of unreality and a crushing metaphor for the sexual and philosophical anxiety that awaits him in adulthood. This is one of those perfect short stories. It's also a great first James Joyce story to read, and is thus well-placed near the beginning of the 1914 collection Dubliners, Joyce's most accessible volume. Yesterday's county fair also reminded me of a powerful early John Updike short story, You'll Never Know, Dear, How Much I Love You, first collected in Updike's 1962 volume Pigeon Feathers. This story has almost exactly the same plot as Joyce's Araby: a kid is excited to go to the town fair, and then finds his naive dream bitterly punctured. As in Araby, the younger kid in You'll Never Know, Dear, How Much I Love You experiences a purely private assault of disappointment barely connected to any external event; in both stories, an attentive reader will realize that the author is committing the actual inner experience of deep psychological depression into prose, sharing a sensation of a debilitating mood swing that must be universal in human experience, or nearly so. One reason I've been thinking about Updike's story in comparison to Joyce's story is that I recently picked up John Updike's extensive 2003 collection Early Stories. The story about the boy at the fair is the book's opening piece, and this prominent placement led me to think again about the story's significance, and to wonder if it is in fact an homage to Joyce's Araby. Is it intentional homage? I think it must be, especially since Updike names James Joyce in the book's introduction as one of the writers that inspired him most (the others are Franz Kafka, John O'Hara, Mary McCarthy, John Cheever, Donald Barthelme, Vladimir Nabokov, James Thurber and Anton Chekhov). The injustice. They pretend he's too little to lose and then keep a dime. The waste. The lost dime seems a tiny hole through which everything in existence is draining. As he moves away, his wet knees jarring, trying to hide forever from every sailor and fat woman and high-schooler who witnessed his disgrace, the six nickels make a knobbed weight bumping his thigh through his pocket. The spangles, the splinters of straw and strings of light, the sawtooth peaks of houses showing behind the heads of grown-ups moving about the scent of grassy mud are hung like the needles of a Christmas tree with the transparent, tinted globes confusing his eyelashes. Thus the world, like a jaded coquette, spurns our attempts to give ourselves to her wholly. Fortunately, though, we had a very nice time ourselves this weekend at the Manassas county fair, didn't experience any kind of existential horror, and even won a couple of stuffed animals. 9 Responses to "At the County Fair With James Joyce and John Updike"
Ray Bradbury can bring out the dark, weird side of a carnival, too... especially for a youngster at night - the unreal sensation of walking through neon-lit facades concealing otherwordly denizens from far away. A collection of Bradbury's short stories called Dark Carnival and later repackaged as The October Country features at least two such tales, The Dwarf and The Jar. Great piece -- two phenomenal short stories, and ones I'd never really connected before. I first read "Araby" in high school, and at the time I identified wayyyy too much with it. As the intolerable Joyce fetishist in the room, however, I have to mention that "Araby" is actually the third story in "Dubliners," not the opener. This takes away nothing from your piece, of course, but just compelled to point it out. Nietzsche said that without cruelty, there's no festival. This quote comes to mind whenever I hear about any event such as a fair. Aggggh! Milton, you are correct, and while you are being very kind in saying it takes nothing from my piece, it certainly does. It disproves my basic theory that Updike was calling attention to the similarity between the stories by placing his in the same position in "Early Stories". I will rewrite that paragraph above. Thanks for the correction. Regarding Action Poetry, I can't log in. That story has dogged me for forty years. A good, and faithful, loving dog. There is a sentence and a tense in "Araby" that lowered me into a stupor. Some equivalent of the future anterior. SHE ASKED ME WAS I GOING TO ARABY. Placement in the collection aside, the similarities between the two stories remain arresting. I say your point still stands. Thanks, Milton -- I actually agree with you, I am just always deeply embarrassed any time somebody finds an error on this site. MUST REMEMBER TO FACT CHECK! I do agree that my main point about the stories is still valid, yes, and I appreciate you dropping by again to say so. Warren -- I love that Nietzsche quote! Kind folks and gentle people, everyone needs a bit of carnival now and then. We have a county fair down here, as do many places. 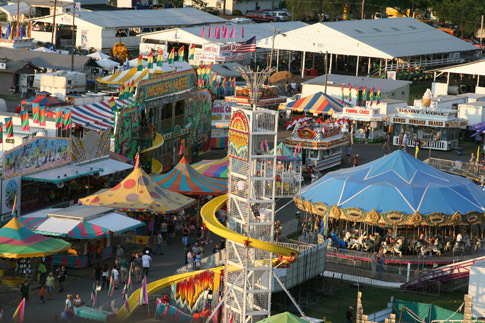 Our Hamilton County Fair is in either late August or late September...Looking forward to it. I believe I went to the one in Manassas, VA when I lived in the DC area many yarns ago. Oh, yes, it has expanded since then. Looks like you had a large time.